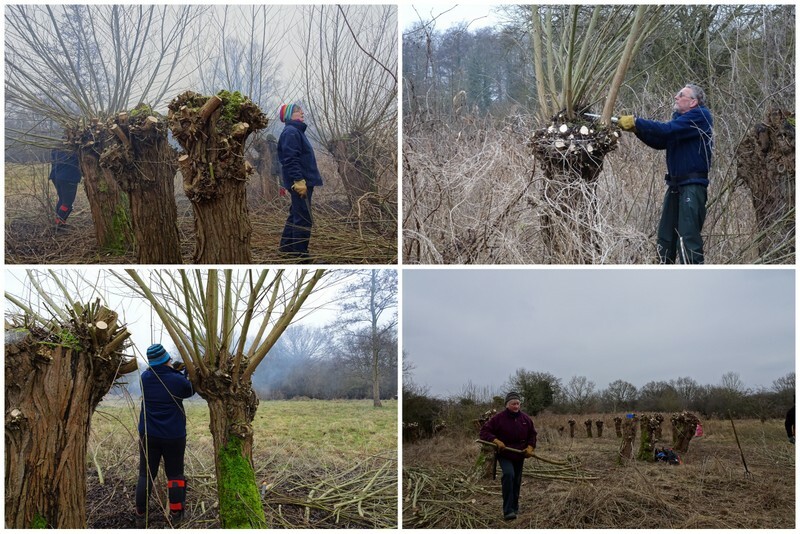 It was a cold, wintery day when we all gathered at the local village hall car park to begin our day’s work on pollarding the circle of Willow trees down near the wet meadow on Swardeston Common. Evidently there is a couple of stories on why the two tree circles existed in the first place. One being that a local villager planted them for his two daughters and the other one was that they were planted to commemorate a late 70’s television program about living in the Iron Age and therefore they were supposed to mimic a roundhouse. Whatever the reason, they are a lovely feature of the place and to ensure they are around for future generations to admire we needed to trim their branches and encourage new growth from them. 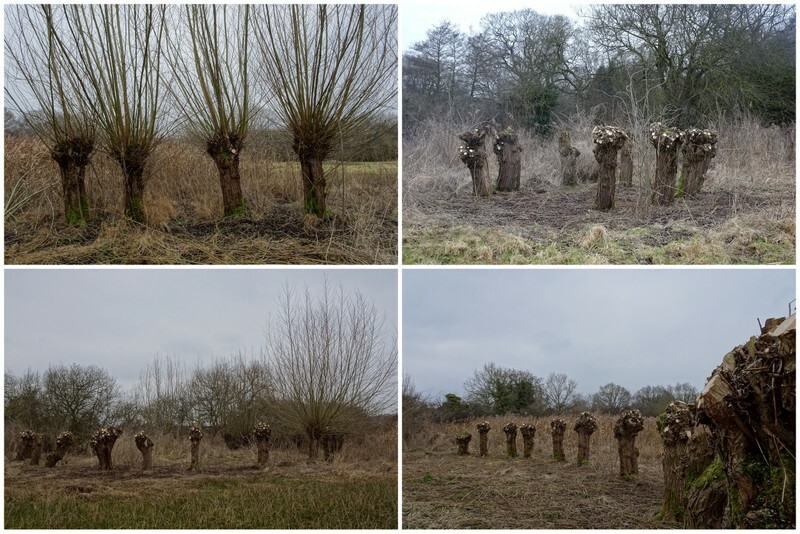 Pollarding of the small and large circles of Crack Willow trees. Armed with our loppers and silky saws we started on the smaller circle while Paula cracked on trying to light a fire to warm us all up and to burn off our cuttings when we dragged them over. The fire bellowed a lot of smoke at first, but after a while the Willow caught alight and by morning tea we were all happily standing around the fire drinking our mugs of tea and chomping through our latest stash of Jaffa and Tea cakes (yum, yum!!). Before and after shots of the Crack Willows. The small circle of Crack Willow trees was finished just after morning tea and now we had set our sights on the bigger circle, which had taller trees and bigger branches to saw and cut through. I selected my tree and started cutting the smaller branches with the loppers and then sawing away at the taller branches balancing on a couple of fallen branches for height. I was last seen happily swinging up and down on one of the branches I had cut to try and dislodge it from the clutches of a neighbouring tree. By the time, I had finished my tree, I could see that between us all we had completed over half of the trees in the bigger circle. Some of the trees are supporting a micro habit containing a beautiful example of a Turkey tail fungi (Trametes versicolor) and some moss. Daffodils were also found at the centre of the big circle. It was a perfect time to stop and call it a day with the remaining trees to be cut the following day by our Friday group (which promised to be even colder than today’s wintery conditions, lucky them)!! 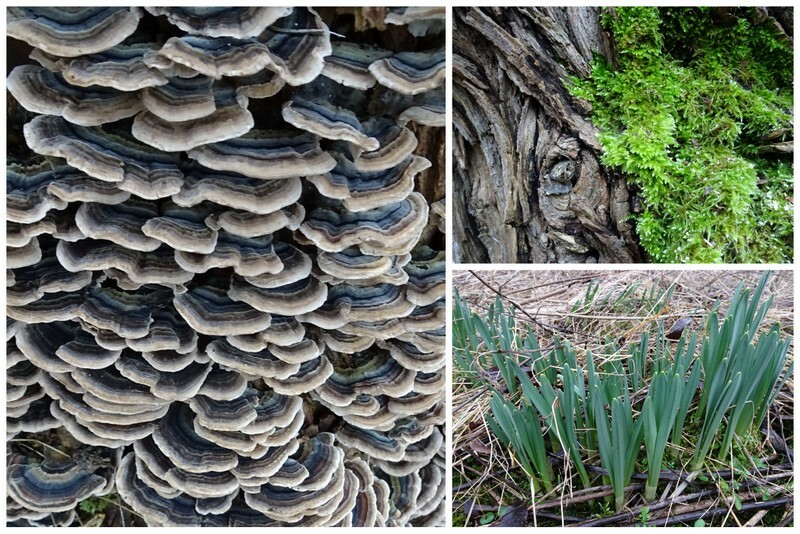 Just before I left for the day, I had a quick look round the wet meadow to see (rather hopefully, I might add) if there were any early flowering plants as last year a group of us surveyed the plant life there for the Norfolk Wildlife Trust. Unfortunately, no hidden gems were found except the early signs of marsh thistles. With loppers stowed away, silky saws sheathed and the smell of bonfire in our clothes and hair we happily walked back to our cars thinking “job’s a good’un”.